It has been a breakout year for both up-and-coming as well as established talent. This is especially true in the medium of the short film. From heart-wrenching and experimental dramas, to mind-bending multi-genre tales, horrifying chronicles of fear and uproarious comedies, here is the list of my twenty favorite related works in this field from 2016. Please note that the name of the director of the piece is provided after the title of the production. Enjoy! Today I have the tremendous honor of speaking with writer and director Chris Esper! Welcome! Can you tell us about yourself? I was born and raised in New Jersey. Growing up, I have always had a lot of love for the arts. As a kid, I thought I wanted to be an actor/comedian like Robin Williams, who was always my favorite. I tried my hand at acting when I was in my teens and part of the drama club. I also tried doing stand-up comedy. I found some success in both areas, but I ultimately felt it wasn’t for me. I was also really interested in puppetry and tried my hand at that as well. Again, I enjoyed it very much, but I felt my talents were in other areas. All the while, I was always a big movie buff and had a love and fascination with movies and most of the arts that I enjoyed always lead back to movies. I think this when I knew I should be in filmmaking. What was the path to becoming a filmmaker like for you? My path into filmmaking came to me when I was about 17 or 18 years old, but before that almost everything I did somehow lead back to film and I never truly realized it. For example, when I was 10 years old, I wrote a thirty page script about a boy and his robot which I called Boy Bot. I think I wrote it because I wanted to act in a movie. I was a big Ghostbusters fan and enjoyed comedy and science fiction, so I wrote this story in a similar vein. I also discovered that two of the actors were also the writers, so that convinced me that perhaps I should write something. I kept telling all my friends in school that I was going to make a movie and everybody wanted to be part of it. I went about sending the script to Columbia Pictures, thinking that if they made Ghostbusters then surely they would make mine. About 6 months to a year later, the envelope came back to me with a “Return to Sender” labelled stamped on it. For some reason, this didn’t hurt or cease my passion, even at age 10. By the time I did reach age 17, I started to see movies in a different way. No longer were movies entertainment, but it was an art form. I trained myself in learning about classic cinema, different directors, etc. I also received my first camera at that age and started making movies on my own. I made a documentary, stop motion animation pieces and most of the time small experimental films and narratives I would star in while also directing, writing, shooting and editing everything. YouTube was new at the time, so I went about uploading these films to a channel. The films were not good by any stretch of the imagination, but other amateur filmmakers were taking note of my work and started following my channel. It was after making these films that I truly knew I wanted to make movies for a living. I found that I could combine all the art forms I grew up to love into one medium while also satisfying my passion for film and storytelling. Are there any movies or fellow directors you look to for inspiration? The movie that made me want to make movies was Raging Bull. Martin Scorsese is easily my favorite director. His passion for cinema is contagious and he’s also a filmmaker that’s taught me about the importance of personal filmmaking. To me, Raging Bull demonstrates all that he believes in in cinema and while also showing his own personality on screen. I love how its shot, the atmosphere, the acting and the overall story and how it unfolds. I recall watching the audio commentary and behind the scenes documentary and hearing Scorsese talk about what he wanted to achieve really inspired me. I feel that the rest of his filmography also follows suit with films like Taxi Driver, Goodfellas, Hugo, The Last Temptation of Christ, etc. All these films carry qualities of himself as a person while showcasing his deep cinematic desires. I find that I enjoy movies by directors that are personal stories and also movies that challenge me and take me to another world. I tend to lean towards films by Stanley Kubrick (A Clockwork Orange, Full Metal Jacket, The Shining), Alfred Hitchcock (Psycho, Vertigo), Charlie Kaufman (Synecdoche, New York, Adaptation, Being John Malkovich), Francois Truffaut (The 400 Blows, Day for Night), David Cronenberg (The Fly, The Brood, Naked Lunch), Charlie Chaplin (City Lights, Modern Times), Darren Arronofsky (Black Swan, The Wrestler), Walt Disney, and Jim Henson. My other favorite films include dark comedies, animation, sci-fi/fantasy and psychological thrillers. I could go on and on! You’ve directed many short films. Among them is “Still Life”, a favorite of mine, which you have said is personal to your own experiences as a cinematic artist. How is this so? I made “Still Life” when I was just finishing college. It’s a film about dealing with criticism as an artist and learning how to grow from it. At the time, I don’t believe I have ever been given an honest critique of my work until I entered college and we would present our projects to the class. I wouldn’t react negatively towards anybody, but I would beat myself up over any kind of feedback, thinking I failed. That side of me would show easily and many would try explain to me that it wasn’t a bad thing. I didn’t see it that way. So, I wrote the screenplay to “Still Life” as a way to express those feelings. In way, it was a therapeutic film to make because I learned something as I made it and it seems that audiences did too. My attempt was to show audiences that everybody faces of fears of criticism, but have to in order to grow as artists. What is it like to release something that means so much to you individually out into the world? It’s so surreal. On the one hand, you’re really excited to share your creation but at the same time you’re scared to death of how it’s going to be received. In the end, it’s one of the most gratifying feelings in the world when you’re sitting in a cinema and watching your film play and watching/listening to how the audience is reacting. This is especially true with comedy. You also know you do a great job when an audience member wants to talk with you further about your themes or how you made the film. That’s when you know your film left an impression on them. You are currently producing your first feature called Higher Methods. It is going to be directed by Nathan Suher. What can you tell us about the project? Nathan and I have been good friends for going on five years now. Higher Methods was a play written by Lenny Schwartz (who also wrote the screen version) which is about fame and the price we pay to achieve it. The basic premise is an actor, Matt, is in search of his sister who has been missing for 10 years. This search leads him down a rabbit hole where he comes across an acting class in which the professor employs unusual and sometimes sadistic methods in order to get a performance out of a student. The film then becomes an ultimate question of what is reality and what is fantasy. I hadn’t seen the play, so when I read the script it was a huge treat for me. I was blown away by it. It’s exactly the kind of film I would direct and/or watch. Nathan had contacted me initially asking me to be the assistant director on the project, which I agreed to. Later, though, he asked me to be in a bigger position of co-producing with him. I was flattered and said “Yes”. We go into production next year. 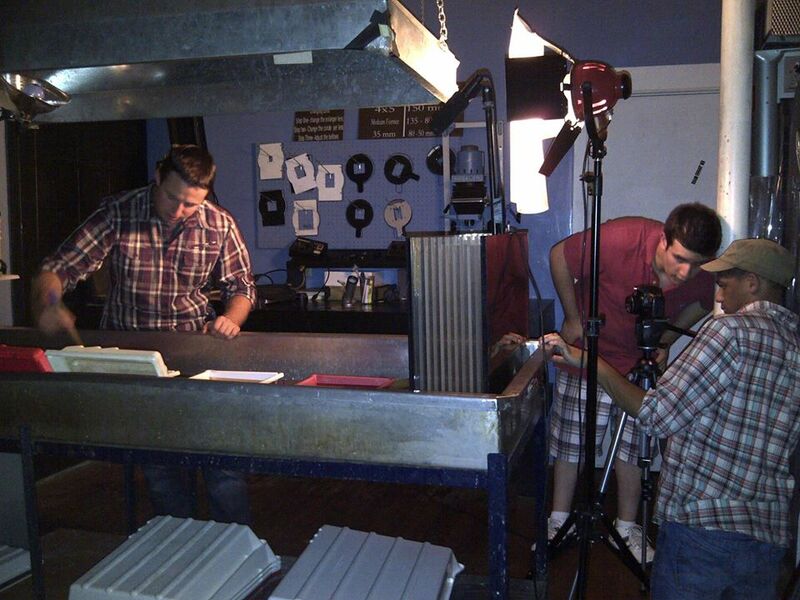 You’re work has played at many different film festivals. You’ve also received a lot of acclaim for your material in these places. For instance, your short, “Steak Knives”, won the Festival Prize for Best Opening Scene in the Stories by the River Film Festival 2015 and In the Bedroom won the Outstanding Achievement Award for Writing in a Drama Series at the LA Web Fest in that year. How important do you think film festivals are to helping indie directors get their work out and recognized? I think it’s extremely important. We live in an age filled with media saturation, so it’s very hard to stand out among everyone else who is also making movies. By submitting and then being accepted into a film festival, it shows that you’re standing out among the rest and that your piece belongs amongst other talented filmmakers. Awards are great, too, but just being accepted is a nice honor whether the festival is big or small. You also have done several music videos. Among the most recent of these is Aaron K. Wilson’s “I Hear the Future”. Is directing a music video a lot like shooting a short film? If so, how? 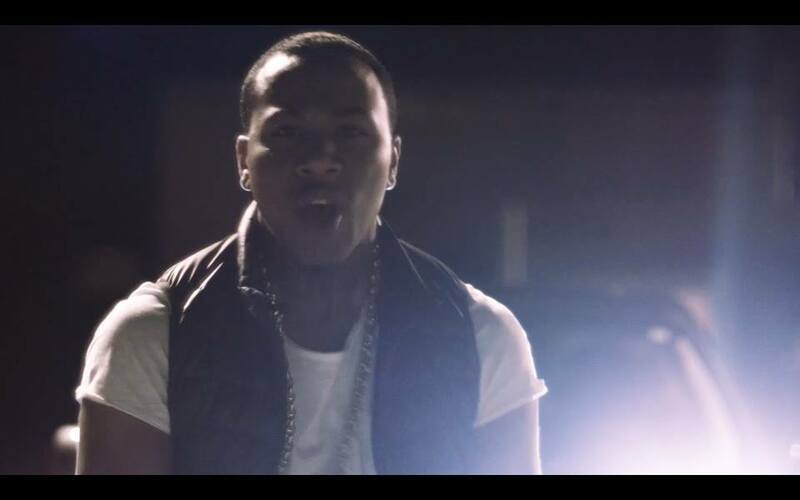 I love directing music videos. I feel that I have more freedom in that I don’t necessarily have to follow a strict narrative structure with a complete beginning, middle and end. I can play with the medium and do something that is a visually narrative and experiment more so than I could with a short film. I also enjoy not having to think about sound when shooting a music video. It usually makes the day go by a little faster without having to worry about that factor. I do also enjoy doing music videos that include a complete story with dialogue as that’s not always done and its fun doing something different like that. You have a book coming out on June 24th, which I highly recommend to everyone, called The Filmmaker’s Journey. It is based on a popular vlog of yours. What was this transition like? I started the vlog earlier in the year. I have been doing this for about six years and I felt that I had a lot experience to share, especially still at a young age. Ultimately, I wanted to help other filmmakers who are either just starting out or thinking about getting into the field. There’s a lot of things that many don’t tell you before getting into it and I wanted to be the one to say what the realities were while also convincing others that this career isn’t impossible and can be done. The transition from vlog to book wasn’t really too difficult. I pretty much had all the information I wanted to get out there. At that point it was just about expanding upon it in book form. At what time did this occur? At the time I decided to write this as a book, I had only been producing the vlog for about a month. I didn’t have a big audience for it at all, but felt it had a ton of potential to be something bigger. I also like to keep my videos short at 5 minutes or less as that usually works well for the internet audience. However, I was a bit frustrated in that there was so much more I wanted to say that I didn’t have to say on video. So, I decided that in order to share my larger ideas and advice, it might be best write it as a book. I had never written a book before, so it was different for me, but also easy because I knew the exactly what I wanted to say. In the book you share a lot of personal stories, experiences and dispense a lot of helpful advice for aspiring directors. Some of this is your definition of what it means to be a director and detailed explanations of technology and filmmaking. You are even kind enough to give A Word of Dreams a shout out in the “Web Sites to Get Your Film Reviewed” section. Thank you! Of all these bits of wisdom can you share one with us that you feel is among the most important? You’re very welcome! I would say that most important is knowing that everyone faces all the struggles I mention throughout the book. I cannot stress this enough. I would always read so many biographies about my heroes and film idols, but they hardly ever mentioned what their struggles or failures were before they became the success that we know them to be. I think it’s very important to know that you’re not the only one as it puts things in perspective if they could face failure, you can too. We have a tendency as humans to look down upon failure and try to ignore, but I feel that it should be welcomed in order to understand that as much as it hurts, it’s what drives us to become successful in life. Every career, especially this one, has no clear path. It’s filled with detours and by trying to compare your failures to someone else’s successes if just a waste of energy. What are the differences and similarities between the process of writing a book and publishing it and creating a film and releasing it? The most obvious difference is one being so visual over the other. With a book, the goal is to keep the reader interested by creating the visuals through your words. Because I have written screenplays in the past and because I tend to be a visual person this was somewhat easy for me. The hardest part for me was writing sentences that made sense while also getting the point across. With a film, the camera work and visuals usually fill in the blanks but with a book the writer has to do that themselves. In terms of distribution and releasing, I would say the process is somewhat similar because it’s all about independently releasing your work by way of digital technology. I do have the self- publishing process to be a little harder because it’s so difficult to find people willing to review your book. Many of the writers I found either charge an outrageous amount of money for a review or you genre isn’t what they want. With a movie, I can easily get 20 reviews for a single short film for very little money and also find a number of avenues to show it. You also have your own production company. It is called Stories in Motion. How did that come about? I started Stories in Motion in March 2016. By that point, I realized that I had making a living as a filmmaker/videographer for 6 years. But, yet, I didn’t have an identity to follow other than my own name. I wanted to create a production company in order to market myself in a better way and perhaps even create further opportunities for myself. In short time that I have had the company, I am finding more success and opportunities than I did in just using my name for 6 years. You are currently penning your first feature film. What is this experience like? It’s a very difficult experience. With short films, I do a little bit of outlining and character development, but for the most part I just dive right in and develop as I write. With a feature, I’m trying my best to do more of that before actually writing the screenplay. To tell you the truth, too, I’m kind of impatient when it comes to writing because I like to just get started and see what happens and experiment. I often feel tied down by first formulating what happens on each page and when a certain beat of the story should happen. Perhaps it’s not the best way to work, but I find it works best for me. It gets easier though as I do more pre-planning. I’m trying to keep the overall story and premise under wraps at this time, but, much like “Still Life”, it’s a very personal story. The main character is basically myself and it’s also a psychological drama with similar elements as the films of Charlie Kaufman. What do you want your audience to take away from your material? I like to make an audience think while also relating to them on an emotional and personal level. I would hope that an audience walks away from one of my films still thinking about it, relating to the characters and maybe even take action for themselves or for somebody else. Do you have any other upcoming projects you would like to tell us about? Yes, there’s lots of exciting things happening. 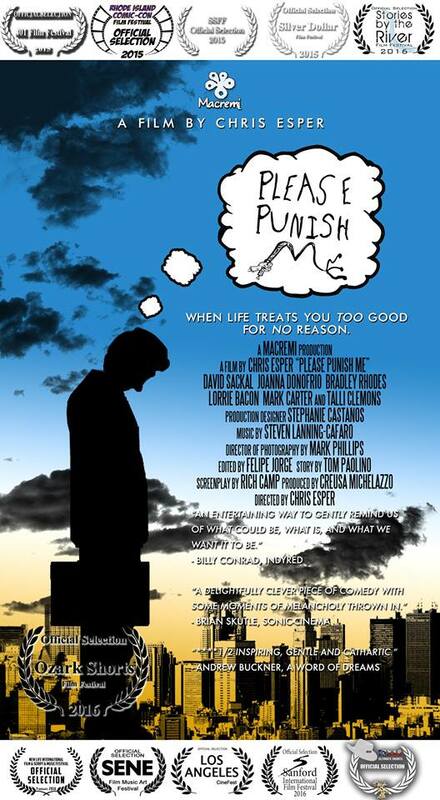 My short film, “Please Punish Me”, is currently making its rounds on the festival circuit and just got into its 13th festival. 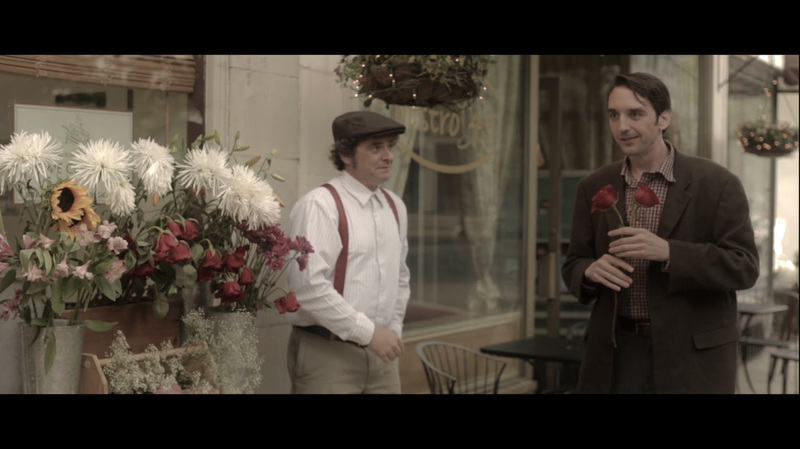 I’m also in the process of finishing production on my latest short film, “A Very Proper Man”, which I’m hoping to release later in the year. My company also optioned a couple of short screenplays for this year including Pride and Money and Smartphone by the very talented Brian Pickard. Both will be produced in 2017. The company also recently optioned The Deja Vuers by Jason K. Allen. That project will be going into production later this summer. 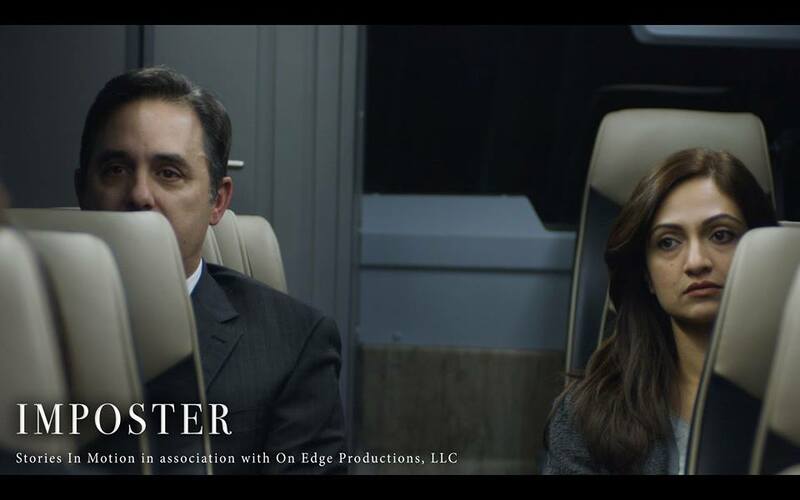 Finally, I’m going into production along with Massachusetts based production company, Stories by the River, this fall on a short comedy film I had written. Thank you so much, Andrew, for the interview and your continuous support of independent cinema! Thank you for your time! I look forward to all your upcoming works! You can pre-oder The Filmmaker’s Journey on Amazon here. You can connect with Chris Esper on Facebook here. Most of the routes of dreams branch out maddeningly into avenues of failure so varied that we often lose sight of the sharply focused paths ahead. They are departures that can be falsely perceived as permanent. Yet, those who find themselves off-road, staring wide-eyed into the obvious sign posts of their addressed defects, especially if it is engraved in their ultimate ambition, often lose hope altogether. Soon they find their feet sinking into the mire of abandoned hopes when such an incident transpires. With this they are wrought in disillusionment. This is rooted in what he or she believes to be the reality that they will never rise up. Furthermore, they feel as if they will never better these errors. They become stuck, some momentarily and most others indefinitely, as the voices of those who pointed out their shortcomings ring forever in a cacophony of eternal humiliation. For many of us, artists especially, such small criticisms cause silent wounds. These forever inwardly scar. They make our once swift movement towards personal reveries immobile. 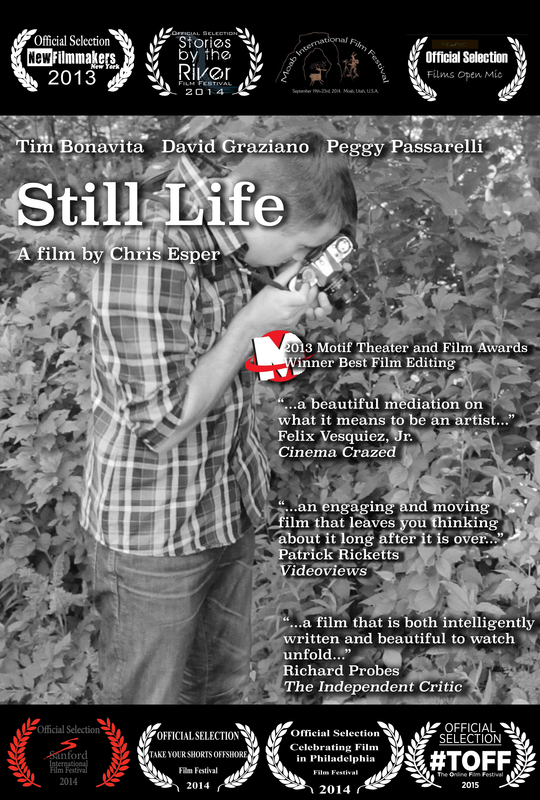 This is the focus of the 2012 short “Still Life”, a cinematic composition worthy of Ingmar Bergman, by writer and director Chris Esper. It concerns a student of photography, Martin (Timothy Bonavita in a part that perfectly conveys all the layers of vulnerability, intelligence and sentiment his character demands). He wants to be a photographer. Yet, as we learn in a beautifully wrought early scene, the world around our wide-eyed and ambitious lead puts him in the line of fire for constant criticism. Still, he is devastated yet, optimistic. The tale walks this fine line of emotion in a realistic, understated manner. It is done in a conscientiously ardent and understanding way. With this modus anyone who has felt defeated by negativity after it is cast at his or her aspirations will undoubtedly find liberating. An early segment showcases him being criticized in front of his peers. This is done in a manner that suggests he just needs slight improvement to be where he needs to be to achieve the first steps of his intended success. It is a sequence that is an analogy for how our main character is feeling. This also communicates his own contemplations about himself through emotion and action. This draws us instantly into Martin’s existence. To further add to this intimacy the camera surrounds Martin like a close friend; one who should speak up in defense. Regardless, he never finds the strength to do so. “Still Life”, made for only $500, finds the right note and atmosphere instantly and never departs from it. To its further credit, the pace is meditative and cerebral. Still, it is always fascinating. This characteristic is, like the rest of the tale, appropriate. It also gives us the necessary time to learn and reflect on Martin’s situation. Such is done without the proceedings ever feeling as if it is ignoring the act of moving the story along rapidly. 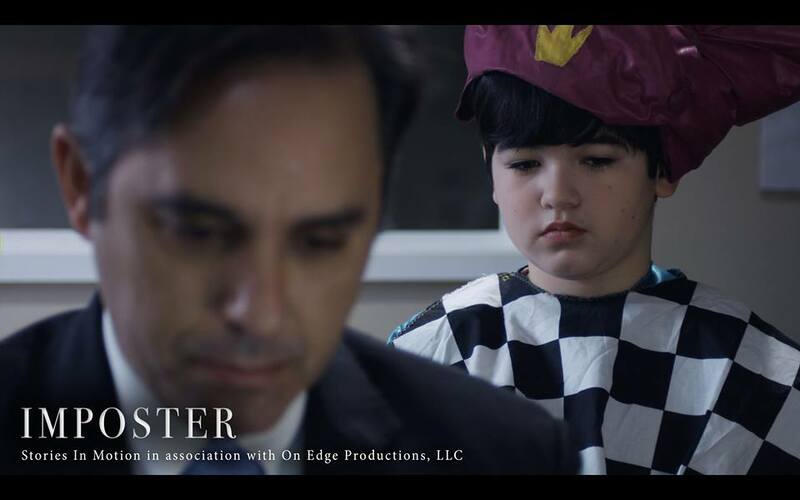 Esper’s brief film never once steps away from following our starry-eyed persona as he continues on despite a succession of letdowns. The crisp and intimate largely black and white cinematography by Mark Phillips adds to the haunting, downtrodden yet inspiring poetry of this massive achievement. It also heightens the previously stated sense of luminosity amid darkness. One especially poignant moment involving Young Martin (Charles Everett Tacker) and Martin’s Mother (Carlyne Fournier) are in color. This segment is highlighted by aching reminiscence. It is only amplified by the stupendous caliber of the aforementioned portrayals. The gorgeously gentle drive of Ryan Campos’ beautiful score is perfectly in sync with the sentiment expressed on-screen. Jill Poisson’s editing is terrific. 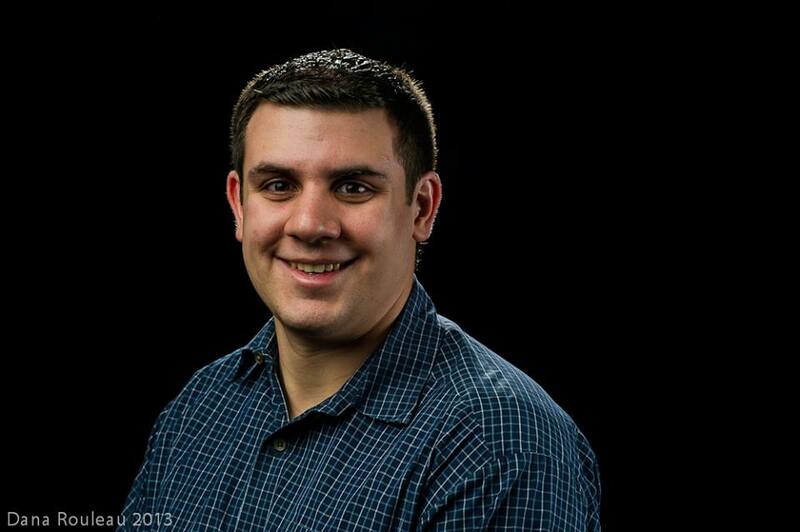 This also issues exemplary acting turns from David Graziano, as Professor Lynch, and Mike Daniels, as Josh. The rest of the cast fares just as well. All of these elements make “Still Life” a contemplative, deeply felt masterpiece. In but eleven scant, but quietly harrowing, minutes Esper and his filmmaking crew triumphantly executes introspection, drama and sorrow. These elements all unify in a silent cry to love and understand those around us. Also, it assures us to that defeat is but a temporary obstacle meant to be overcome. Martin states about a flower he photographed in the first few minutes of this heart-wrenching work that he wanted to “convey a solidarity of loneliness”. That is exactly what Esper and his crew have done. They have framed the chief protagonist as the lone blossom. His seclusion is the focus of what lies enclosed in the picture. In turn, the work itself and the character radiate a melancholy splendor. It illuminates the moving photograph it is contained in. From here it touches our core. In turn, we relate and feel unified with the central figure of the narrative. Maybe Martin isn’t so alone after all. The beauty of the silent film era lies primarily in the actuality that the actors had to use facial expressions to supplant the sentiment that would later be inserted into dialogue. This was usually accompanied by either recorded or live music being played in the theater the work was being projected in to punctuate the emotions glimmering through actions and countenances on-screen. These, along with tale-telling through striking camera angles, shadows, mimes and title cards, were the sparse tools of the filmmaking trade in the years from 1894-1929. It gave the cinematic compositions of this period an underlying sense of poetry, even in comic endeavors, which have proven to be forever endearing. This time frame, more often than not, elucidates a constant sense of admiration for these aforementioned attributes alone. Such is just one of the many reasons “Right There”, a masterful eleven minute short from director Nathan Suher (2015’s “Next/ Door” and “Scary Little F*ckers”), is so immediately enjoyable and charismatic. Suher, who wrote the delightful, well-paced script (from a story by Gregory Capello, Suher and Ian Taylor), captures the essence of Charlie Chaplin and the spirit of European cinema, which he has stated was his intention with this glorious piece, immaculately. This wonderful, breezy homage concerns a man, The Guy (Ryan Hanley in a performance that is as energetic, endearing and enjoyable and perfectly fitting for the era Suher tributes) who tries to garner the attention of a woman, The Girl (Lauren A. Kennedy who does as phenomenal a job as Hanley, as does the entirety of the secondary cast, in conveying story through gestures). He is drawn to her immediately. This intrigue only grows as he finds her sitting everyday on the same bench. Over the course of several weeks he tries to get her to notice him. Because of the profoundly artistic nature of the epoch “Right There” is sending up we are drawn in by the nuance. Moreover, our intrigue is piqued by the high-caliber technical facets, the joy and broken-heartedness (sometimes in the same scene) that Suher and his filmmaking team pull off so effortlessly. Yet, because of the well-woven dramatic touches that balance the humor and heart terrifically we are forced to look deeper. This is a testament to the profundity of the style of cinema Suher emulates so masterfully here. It is also a demonstration of the terrifically executed brilliance, the obvious admiration for the truly golden age of cinema Suher is tackling radiating on-screen. This is a gem. The merry, often tender, and beautiful result of “Right There” is also thanks to a wonderful bit of opening animation by Dave Lubelczyk. Make-up artist Morgan Duffy captures the appearance of stars from the early 1900’s spectacularly. Chris Esper’s film editing is tremendous. Jill Poisson’s cinematography and Kevin Keough’s score is striking and beautifully rendered. These characteristics, combine to make it all the easier to envision that we are sitting in a theater, before the age of “talkies”, and enthralled by this new invention that they call “moving pictures”. Suher continues to showcase further range and a willingness to risk differing genres, atmospheres and approaches. The work he makes is transcendent to, not only fellow admirers of filmmaking, but everyone. “Right There” is a sweet, lively brief work that reminds us of the tenderness, merriment, relatability and undeniable artistry the craft of unspoken big-screen storytelling can evoke.